We walked the other day, between ancient trees, draped in fine clothes of moss and lichen. The air was as pure in the mouth as spring water, and the sounds of the outside world were muffled and absorbed by the soft green cloaks of moss. Only birdsong and the gentle breeze moved the air, and the beauty of stillness filled our souls. In dappled pools of sunlight, the moist air softened our skin, and the perfect co-operative balance of life unfolded around us. We were walking in the magic of a Celtic Rainforest, unchanged for thousands of years. The lichen drapes itself in generous layers over branches and trunks, the perfect partnership between the form and shape of a fungus, and the photosynthetic energy production of an algae. This partnership produces a wild array of shapes and colours, all living examples of successful co-operation between species. And what a beautiful display is produced by this symbiosis. In Spring , long before the fresh leaves of the season open to cover the branches, the trees proudly display their winter coats of lichen. These Celtic Rainforests stay green right through the heart of winter, with their beautifully textured and coloured lichen leaves. With names like old mans beard, gold dust, great shield, moonglow, silverskin, sunburst, greater whip wort, witches hair and lungwort their fairytale enchantment casts a timeless spell. When examined closely they become little forests of trees within large forests of trees, weaving a greening spell across the earth. The lichen draw their food, nutrients and water, from the air itself. This magic is supported by the carpets of moss and liverwort which absorb and release the mist and rain, in just the right amounts to sustain a wonderfully moist air. This soft green velvet sponge is the climate control of these rainforests, and it coats every stone, climbing up around the bases of the trees, and perhaps if we stood still long enough it would flow over our feet too. 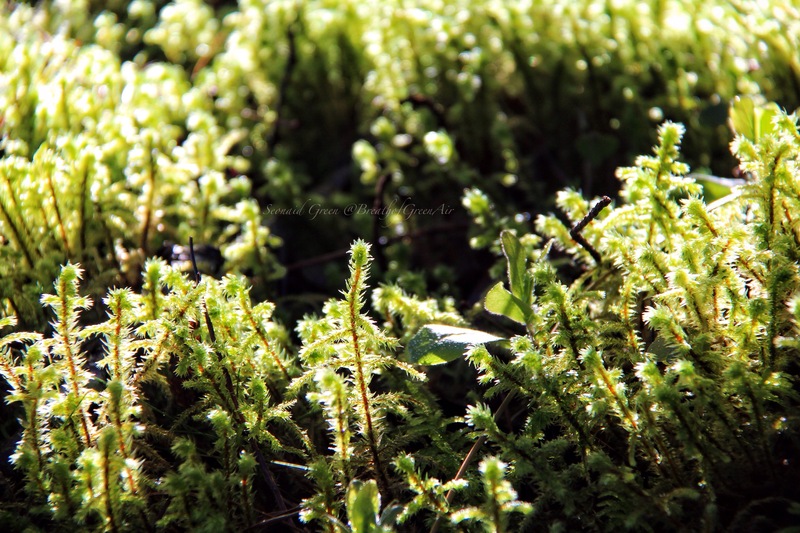 The mosses and liverworts grows in thick lush mounds as soft as a sponge, and covering the whole landscape. It gives the feeling of eternity, as though nothing has disturbed this ancient landscape for millennia. Among the native hazels, oaks and birch a whole unseen layer of life is rolling on unaided, and untouched by human hand. Some of the Atlantic hazelwoods around Skye, Lochalsh, Argyll and the Western Isles are thought to be over 9,000 years old, which is pretty close to eternal in my mind. Nothing needs to be done here, life just needs to be left to carry on as it has in the ever-rolling seasonal cycles. 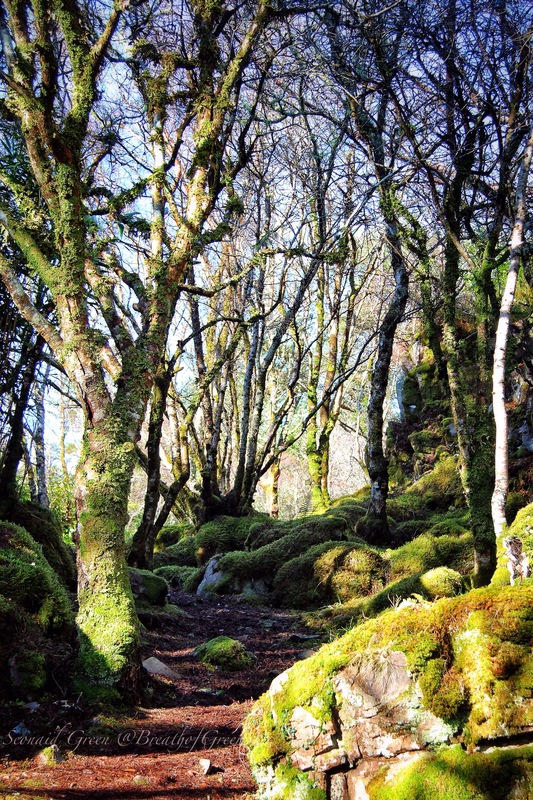 Forests of lichen and moss filter the air to produce the freshest sweetest breath of green air I have ever breathed. Silence rings like tiny silver bells in my ears, and I am transported somewhere far from everyday jangles and tangles, into the soft green lichen woods of Scotland’s West Coast, and the land of fairy enchantments. There is nothing to do but rest and breathe and listen, and let your imagination run wild and free. You can read more about the incredible nature of Scottish lichens here. And this is a lovely link to information and a map of sites of the Celtic Rainforests of Scotland. 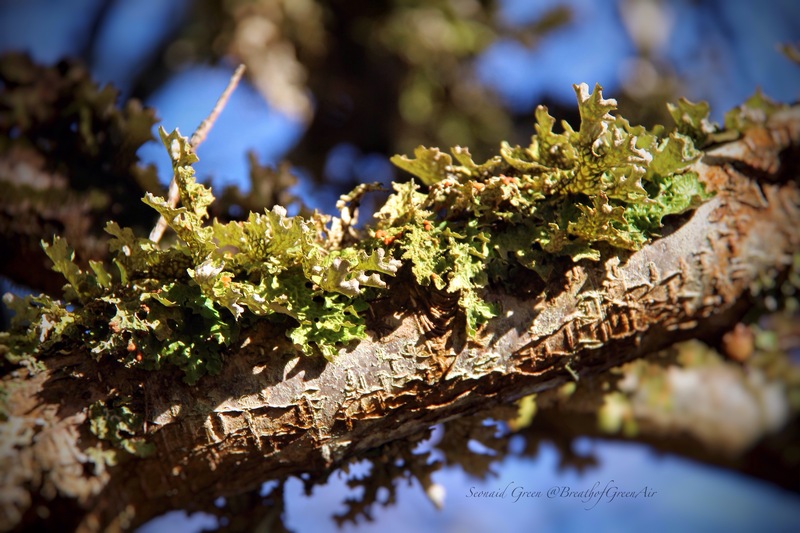 Lichens, mosses and liverworts have long been used for dye and for medicinal properties. Many have antibacterial and antiseptic properties, and were used for centuries for packing the sword wounds of clan warriors. 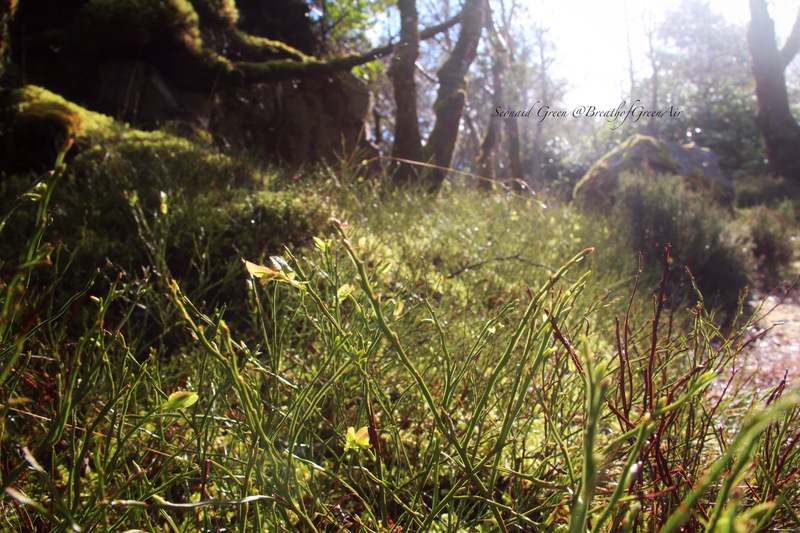 This entry was posted in elemental, mindfulness, nature photo and tagged Atlantic Hazelwoods, biology, Celtic Rainforest, druid, lichen, mindfulness, nature, photography, scotland, trees, woodland. Bookmark the permalink. The names of those fairyland plants stir the imagination, “old mans beard, gold dust, great shield, moonglow, silverskin, sunburst, greater whip wort, witches hair and lungwort.” Ahhh. What a lyrical glen of poetry you have in your land. What fairyland was modelled on. This is like walking into a fairy wonderforest. 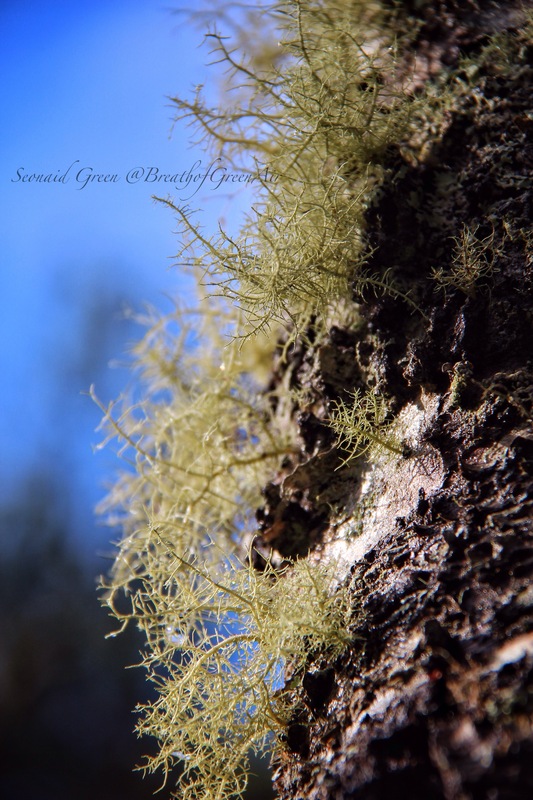 Lovely captures of lichens and moss, Seonaid. Magical, Seonaid. I love lichen and moss. Your photos are enchanting. I do love moss and lichen. What gorgeous shots. Walking with you through the magical forest was the perfect way to start the day. Thank you :-). Such a pity that the land barons denuded Scotland and took away so much of this rich habitat. These woodlands are uniquely Scottish, I think, and beautifully described, Seonaid. Oh that third photo down is lovely. Captures the softness. And your description of looking closely and seeing the little forests of trees is so apt. Tiny, little forests. Amazing captures of some incredible beauty Seonaid. I saw a great deal of this when I visited Scotland and found it enchanting. One expects a fairy or gnome to jump out from behind the trees at any moment! A fine appreciation. A beautiful, and satisfying, blend of technical correctness and poetic verse. You’d better watch out Seonaid … or you might morph into a biologist if you don’t be more careful! Wonderfully done. Nice. A mystical, pristine treescape, full of miniature worlds! I marvel at the history of your land and chuckle at the names of the lichen. I do expect a leprechaun to pop out any minute. Your pictures depict the serenity of your land. It is so beautiful and restful! Your photography is amazing. 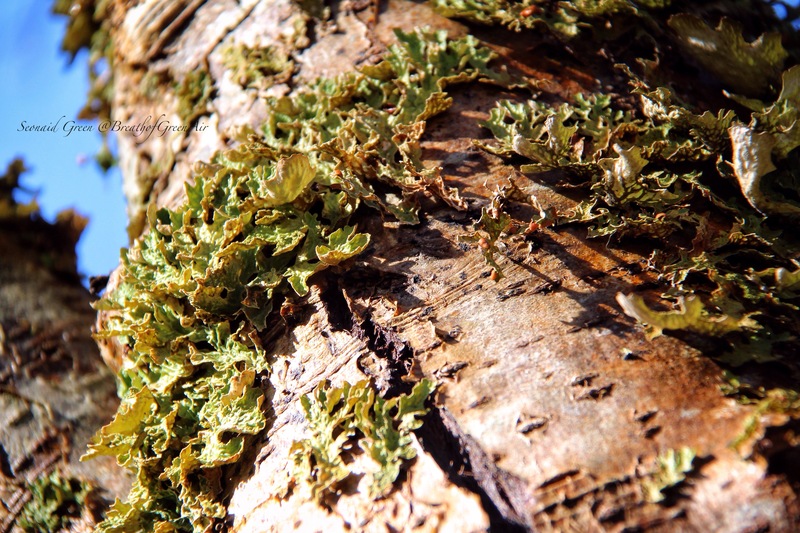 The lichen do have some wonderfully magical names Gwynn😆 These ancient woodlands and forests do have a very special atmosphere, and Spring is one of the best times to visit……by midsummer the midges have arrived and will chew you half to death on a still airless day! Incredible photos – I imagined myself sitting somewhere in the top photograph and listening to my music (Vivaldi) playing. I know our title said “Stillness…..” but, ……….